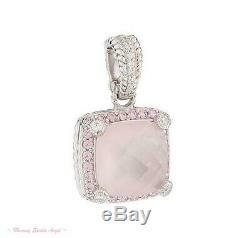 Judith Ripka Sterling Silver, Rose Quartz & Pink Diamonique Enhancer/Pendant. 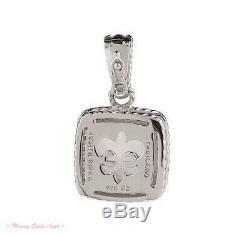 From the Judith Ripka Sterling Silver Collection comes this simply sweet & all done in pink enhancer/pendant. A rose quartz by any other name wouldn't look as sweet as the one showcased in this gorgeous enhancer. It is surrounded by a border of round, bead set, pink Diamonique(R) simulated diamonds. More gleam comes from round, bezel set, clear Diamonique(R) simulated diamonds around the main design & round, bead set Diamonique(R) stones on the snap bail with the safety catch. Sterling silver metal work & settings. 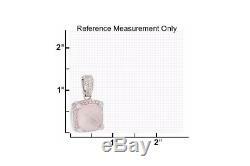 Rose Quartz weight is approximately 11.00 full carats. Total Pink Diamonique(R) weight is 75 points. Total Clear Diamonique(R) weight is 25 points. Open gallery with twisted rope design. Snap hinge bail with a safety catch that is tight & secure. Including the bail, measures approximately 1 & 3/8" Long by 3/4" Wide. The enhancer is engraved with Judith Ripka, 925, CZ & Thailand hallmarks. 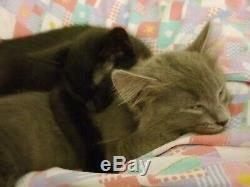 I mean kittens (pictured above) in a smoke free environment. Thank you & Have a Blessed Day!! 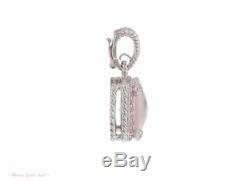 The item "Judith Ripka Sterling Silver, Rose Quartz & Pink Diamonique Enhancer NWOT" is in sale since Tuesday, March 12, 2019. This item is in the category "Jewelry & Watches\Fine Jewelry\Fine Necklaces & Pendants\Gemstone". The seller is "mommyspoilsangel" and is located in Fresno, California. This item can be shipped to United States, Canada, United Kingdom, Denmark, Romania, Slovakia, Bulgaria, Czech republic, Finland, Hungary, Latvia, Lithuania, Malta, Estonia, Australia, Greece, Portugal, Cyprus, Slovenia, Japan, China, Sweden, South Korea, Indonesia, Taiwan, Thailand, Belgium, France, Hong Kong, Ireland, Netherlands, Poland, Spain, Italy, Germany, Austria, Bahamas, Israel, Mexico, New Zealand, Philippines, Singapore, Norway, Saudi arabia, United arab emirates, Qatar, Kuwait, Bahrain, Croatia, Malaysia, Brazil, Chile, Colombia, Costa rica.